The tribal wing of the Bharatiya Janata Party (BJP) organised a ‘Dhanyabad Rally’ on Wednesday to thank the Prime Minister (PM), Narendra Modi, and the Chief Minister (CM), Biplab Kumar Deb, for renaming the Agartala airport as Maharaja Bir Bikram Kishore Manikya Airport. 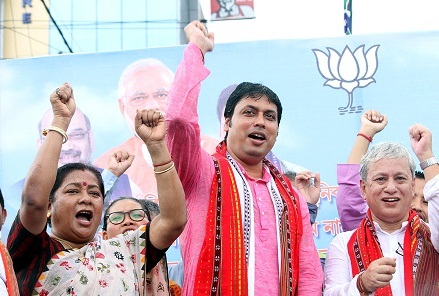 The rally started from the Vivekananda Stadium and covered the main roads of Agartala and ended in front of the Rabindra Centenary Hall where the BJP leaders felicitated the CM. Addressing the gathering, the CM lauded Late Maharaja Bir Bikram Kishore Manikya as a “great” ruler and also reminisced his contributions in building a “modern Tripura”. Deb further stated that the Maharaja had a dream of making Tripura a “prosperous State” and believed in “inclusive development” i.e., the development of all segments of people. “He could not realise his dreams as he died young. However, the BJP Government will pull out all stops to make the Late Maharaja’s dreams a reality,” remarked Deb. Deb praised PM Modi for keeping up with the party’s pre-poll promise made before the last Assembly election – to rename the Agartala airport after the last princely ruler of Tripura. “This was what the majority of people in the State wanted and Modiji has fulfilled the wishes of the people,” said the CM. The CM also informed the media persons that all the CMs of the northeastern States had decided in the said plenary session to make the region “free of drug addicts”. The Deputy Chief Minister Jishnu Dev Varma, the Social Welfare Minister, Santana Chakma, and the Chief Whip of Tripura Legislative Assembly, Kalyani Roy, also attended the rally. Earlier, the Union Cabinet on Wednesday gave its approval to rename the Agartala Airport in Tripura as ‘Maharaja Bir Bikram Manikya Kishore Airport’, after the last princely ruler of the State who was an enlightened and benevolent ruler. The Agartala Airport was constructed in 1942 on the land donated by him.